Alpha Chi Sigma hosts many national, regional, and local events for Brothers, friends of the Fraternity, and the community. These may be social or professional events, Regional Conclaves, member bonding outings, or community outreach events. The St. Louis Professional Chapter has been working hard over the past biennium to increase our involvement in outreach and social activities. In 2014, there was a risk of the chapter going inactive, but an influx of new members bringing new ideas has resulted in a much stronger chapter. In fact, the St. Louis Professional Chapter received the Vincent A. Sedlak Award for outstanding professional chapter in the 2014-2016 biennium! Although our Fraternity's National Office is in Indianapolis, the official "Crossroads of America", there are a large number of Brothers who pass through the St. Louis area on business or personal travels. 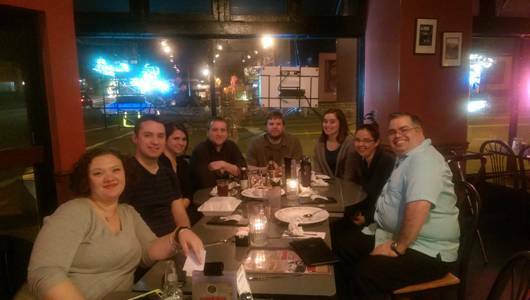 There are often calls for "Emergency Ad-Hoc Meetings" at one of the region's local restaurants, such as when GR Pat Johanns and his family were in St. Louis for a gymnastics meet, or GPDC Oliver Penrose came through town. For the past several years, Brothers of St. Louis Pro have also promoted the chemical sciences as part of a STEM (Science, Technology, Engineering, and Mathematics) Extravaganza in Hazelwood, Missouri. Almost 1000 members of the public attended the event; we had the opportunity to talk with high school student about furthering their education in the chemical sciences, and we performed age-appropriate demonstrations for students in elementary and middle school. 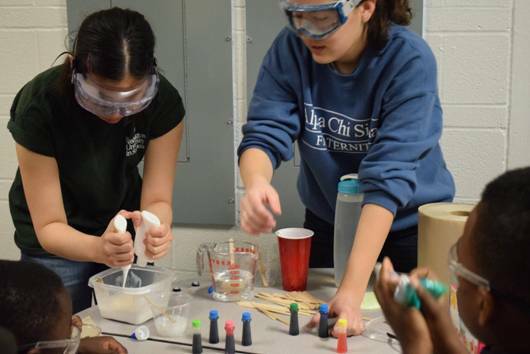 The students learned how to make a non-toxic acid-base indicator, played with non-Newtonian fluids, extracted octoploid DNA from a strawberry, performed indigo dye synthesis, and performed chromatography with markers and candies. 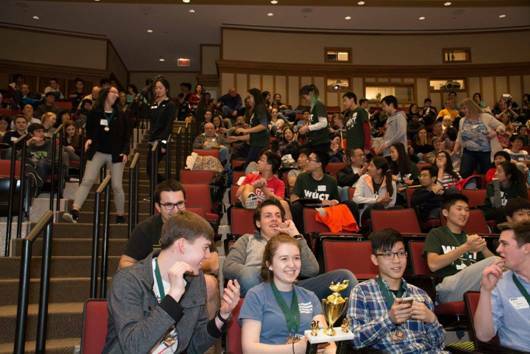 This past year, Collegiate Brothers of the Alpha Epsilon Chapter at Washington University in St. Louis founded the Washington University Chemistry Tournament (WUCT) and held the inaugural annual tournament with 30 six-member high-school teams from Missouri and around the region competing. Brothers of St. Louis Professional were happy to assist, and worked as graders, scorekeepers, and catering duties. It was an incredible event - we are especially proud of our Collegiate Brothers for undertaking and executing it, and we look forward to assisting in the future!